April 12th 2019, dearly loved mother of Michelle, much loved daughter of Meta and the late David, sister of Alan, aunt of Yasmine and great-aunt of Jayden and Cameron. A Service will be held in Fleming & Cuthbert Funeral Home 141 Mill Road, Ballyclare, BT39 9DZ on Tuesday 16th April at 2.00 p.m. followed by interment in Ballyclare Cemetery. Family flowers only please. 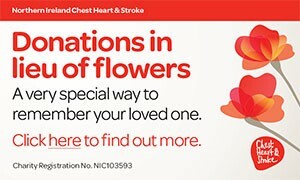 Donations in lieu, if desired, to Chest, Heart & Stroke c/o Fleming & Cuthbert Funeral Directors at the above address. Will be sadly missed by her brother Geoffrey, sister-in-law Andrea, niece Laura and husband Steven and nephew Andrew. I am sorry to tell you that Jennifer Phyllis STEELE has passed away.